Betke, Carl. "Lacombe". The Canadian Encyclopedia, 12 May 2016, Historica Canada. https://www.thecanadianencyclopedia.ca/en/article/lacombe. Accessed 18 April 2019. Lacombe, Alta, incorporated as a town in 1902 and as a city in 2010, population 11 707 (2011c), 10 752 (2006c). The City of Lacombe, the county seat for the County of Lacombe, is situated in rolling parkland some 118 km south of Edmonton. Lacombe, Alta, incorporated as a town in 1902 and as a city in 2010, population 11 707 (2011c), 10 752 (2006c). The City of Lacombe, the county seat for the County of Lacombe, is situated in rolling parkland some 118 km south of Edmonton. 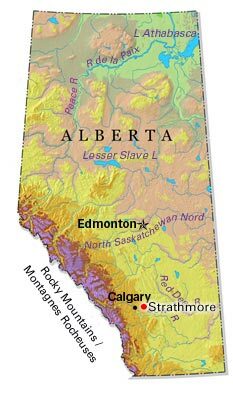 Settlement appeared as early as 1883 but increased after construction of the Calgary-Edmonton Railway (1890-91). The new railway townsite was named for Father Albert LACOMBE. 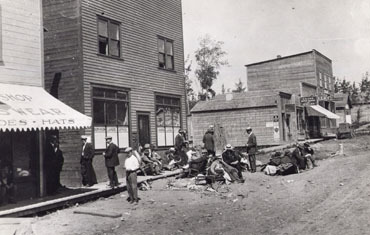 Growth between 1900 and World War I stabilized when it became clear that Lacombe would not become a major divisional point or the terminus of a line to the Brazeau Collieries. The city has served an agricultural region featuring cereal crop production and mixed farming, an emphasis notable in the work of the Dominion experimental farm at the Lacombe RESEARCH STATION, originally established in 1907. The provincial Field Crop Development Centre was located here in 1978. Food processing and servicing the petroleum development and exploration sector are also economic activities. Lacombe experiences strong residential growth because of its location within the Calgary-Edmonton corridor and its proximity to RED DEER. Lacombe's historic downtown features many restored early 20th-century Edwardian-style buildings and numerous murals based on a local heritage theme. Its museum and archives are located in the house where Roland MICHENER, governor general of Canada (1967-74), was born and spent his youth. From modest origins in 1909, the Seventh-day Adventist Canadian University College has developed into an accredited institution offering degree, diploma and certificate programs. This strong growth allowed the town of Lacombe to apply for city status, which it received in 2010.